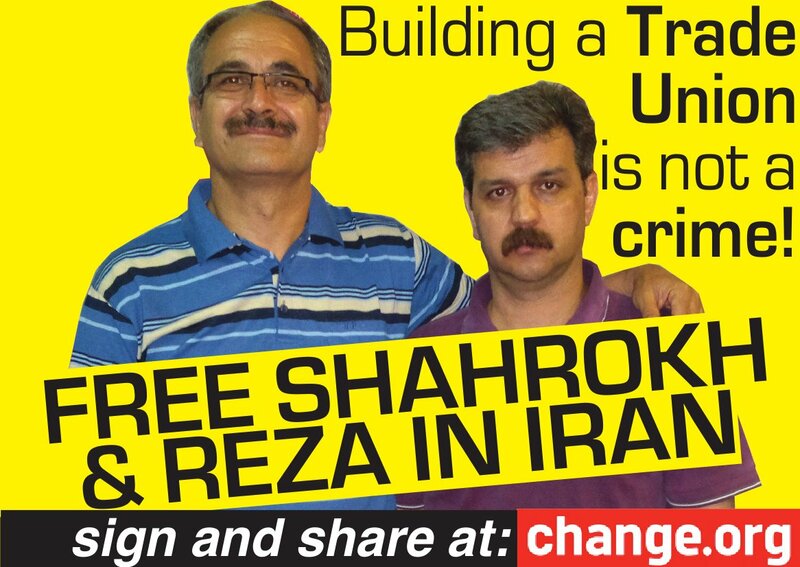 This website began its life in September 2013 in the campaign to free Shahrokh Zamani and Reza Shahabi from imprisonment in Iran for the ‘crime’ of Trade Unionism. The original statement is below. Tragically, Shahrokh died in prison in September 2015. See the statement here. Those who supported the campaign have vowed to fight on, to remember Shahrokh and honour his memory by building a solidarity movement in Britain and worldwide. The Shahrokh Zamani Action Campaign was officially launched at a meeting on 20 October in London. See the report here. Join us! Shahrokh Zamani and Reza Shahabi are in jail in Iran for organising independent trade unions, along with many other Iranian trade union activists. Whilst trade unions are not technically illegal under Iranian law, state sponsored unions are used to quash independent unions and activists like Shahrokh and Reza are charged with offenses such as “propaganda against the state” and “acting against national security by establishing or membership of groups opposed to the system.” Shahrokh was initially arrested in June 2011 charged with “acting against national security by establishing or membership of groups opposed to the system” and “spreading propaganda against the system”. He was sentenced to eleven years in jail starting in January 2012. Shahrokh is a founding member of the Paint Workers Union in Tehran. Since he has been in jail Shahrokh has been further charged with “insulting the leader”. Shahrokh has suffered interrogation, torture and has been moved between prisons unexpectedly several times. In March and April 2014 Shahrokh went on hunger strike. Shahrokh’s hunger strike left him weak and with health problems, during his hunger strike he was refused access to medical treatment. Reza Shahabi has been in jail since June 2010, charged with “propaganda against the state” and “acting against national security”. He is the treasurer and executive board member of the Bus Workers Union in Tehran. Reza was brutally beaten during his arrest and in subsequent interrogations. He has been left with multiple health problems, including severe neck and back pain from spinal injuries. He has repeatedly been denied access to health care. Twice during his time in prison Reza has resorted to hunger strikes to get access to urgent medical treatment. In September this year he finally got some of the surgery that he needs. We are campaigning for the release of Shahrokh and Reza and for all charges against them to be dropped. We aim to collect 10,000 signatures by February 11 2015 to hand in to the Iranian Embassy in a protest on that day. Will you help Shahrokh and Reza? • Take a petition around your union branch meeting, ask your work colleagues to sign or pass a petition around a university lecture you are in. • Organise a regular street stall; make banners and placards, ask members of the public to sign the petition. • Change your facebook and twitter pictures to support Shahrokh and Reza. • Write to your MP and ask them to sign the Early Day Motion tabled by John McDonnell. • Join us outside the Iranian Embassy, London on February 11 to hand in our petition signatures.